In response, Mayor RICHARD BURTT O'BRIEN told the Record: "I'M DONE." He's not running again. The Record and citizens should ask if Mr. O'BRIEN should consider resigning as Mayor. 1. Omits the word "fine." 2. Did not document efforts to obtain comment from the complainant, Dr. Michel S. Pawlowski, D.Sci..
3. Did not report that the complainant was kept in the dark by the Florida Elections Commission and told it would be "three weeks" after the May 17, 2017 meeting before he would be told what happened. 4. Did not report that the proposed order text was kept secret from the public and Dr. Pawlowski. 5. Did not include a photo of the offending campaign postcard (above). 6. Did not explain the weak-kneed, secretive and unfriendly nature of the Florida Elections Commission, which keeps complainants in the dark, even about the terms of weak consent orders "resolving" their complaints. 7. Failed to note that none of the materials are available from the Florida Elections Commission website or staff, whose haughty responses are below the Record story. 8. Failed to perform any legal research, as Jake Martin does (he's the standard of care for reporting in our town today). 9. Allowed affectations of martyrdom, without opposing views, by lawbreaking Mayor RICHARD BURTT O'BRIEN. St. Augustine Beach MAYOR RICHARD BURTT O'BRIEN, knowing of the secret process, obviously gave the story to the Record, knowing it would appear on Saturday, unread by some. That's how government PR "spins" it, as any viewer of The West Wing will kindly recall, using the expression "take out the trash" to describe the process of unloading bad news on Friday, assuring brief attention by inattentive readers of Saturday newspapers. St. Augustine Beach Mayor Rich O’Brien recently paid $200 to clear up a complaint with the Florida Elections Commission over campaign literature used in the 2016 election. The issue stemmed from his use of the phrase “Republican’s Choice” on campaign fliers circulated before the November elections. Republican Party of St. Johns County Chairman Bill Korach wrote a letter to O’Brien in October on party letterhead and asked called on him to stop using the phrase. 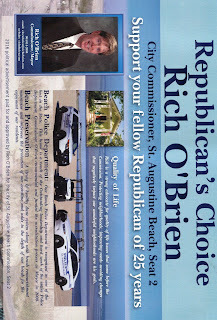 Korach’s letter called O’Brien’s use of the phrase “Republican’s Choice” misleading because the Republican Party had endorsed O’Brien’s opponent, Rose Bailey. He also noted that the St. Johns Democratic Party had endorsed O’Brien. Michel Pawlowski, father of St. Augustine Beach Vice Mayor Undine George, filed a complaint with the Florida Elections Commission in November. Pawlowski handles field activities for the Republican Party of St. Johns County, but the complaint wasn’t an action by the party, according to Korach. The consent order focuses only on one “legally sufficient” allegation of a Florida Election Code violation, that O’Brien campaigned based on his party affiliation in a nonpartisan race, according to the Florida Elections Commission consent order. The commission approved the order 5-0 this week. The commission considers the allegation a minor violation. Signing the the consent order does not mean O’Brien admitted or denied violating a section of the code, according to the order. O’Brien signed the order in March, which required him to pay a civil penalty of $200 to the Florida Elections Commission by close of business on March 27 in order to avoid an investigation into the allegation — which could lead to a civil penalty of up to $1,000, depending on the results, according to the order. “There’s a lot of fanfare going on about nothing,” O’Brien said. Records in the case were confidential until after the hearing. In response to the complaint, O’Brien’s said he is a Republican and was a choice of two opponents. “I feel like it was a very appropriate mailer because there was a choice of two Republicans running for the same seat,” O’Brien said. He also said he didn’t understand why the Republican Party endorsed Bailey, since party officials never asked him any questions about his positions on issues, he said. As for any future campaigns, O’Brien said he’s been a beach commissioner since 2006 and it’s time to give someone else a chance to serve on the commission. You'll be done in January 2018. That is the soonest by law a re-call campaign can be launched against you ! Plus that is not the only cheating you did to win. You fought the good fight and should continue. 1. Please send the documents now. 2. The hearing was three (3) days ago. This is old news and the respondent shared the order with the local newspaper, depriving others of equal, timely access to this information. 3. Why has our Florida Elections Commission still not placed the documents upon our FEC website? 4. This is negligence -- it breaches the standard of care and violates the First Amendment and Article I, Section 24 of our Florida Constitution -- the latter adopted by 3.8 million Florida residents voting in 1992 (83%). 5. These are our records -- please show respect for democracy. 6. Our Florida Elections Commission staff in Tallahassee seems utterly unfriendly and unhelpful -- y'all lack a welcoming spirit. Why? 7. When will our Florida Elections Commission stop violating the First Amendment and Article I, Section 24 of our Florida Constitution? Please call to discuss. In response to your request for a copy of “the proposed consent order and file on Mr. O’Brien, including FEC 16-673,” the Florida Elections Commission does not have any public records responsive to your request. I trust this answers your request for public records and information from the Florida Elections Commission. Please let me know if you have additional questions. Please send me the proposed consent order and file on Mr. O'BRIEN, including FEC 16-673, for which notice was given of a May 17, 2017 hearing. Attached is a copy of the public records responsive to your request. If you have any questions, please let me know. Please send me the May 16-17 meeting agenda and the file on complaints against St. Augustine Beach Mayor RICHARD BURTT O'BRIEN.